Another officer who works with Megure and has a crush on Sato which is somewhat awkwardly requited. Takagi has an appearance of ineffectual nervousness, but he's not as useless as he seems. He is quick to assess a situation and take immediate and decisive action when necessary are points in his favor. 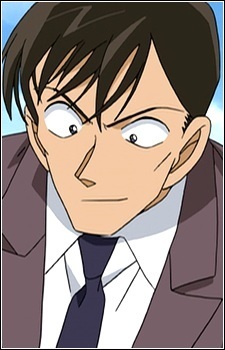 Takagi's full name and kanji comes directly from his voice actor Wataru Takagi. Created for the anime (but later appearing in the manga), the character was originally an unnamed police detective, but during one recording session Chafurin (Inspector Megure) read the line "You, what's your name?" to the character, and Takagi adlibbed the response "It's Takagi, sir! ", and he has been referred to as such ever since.